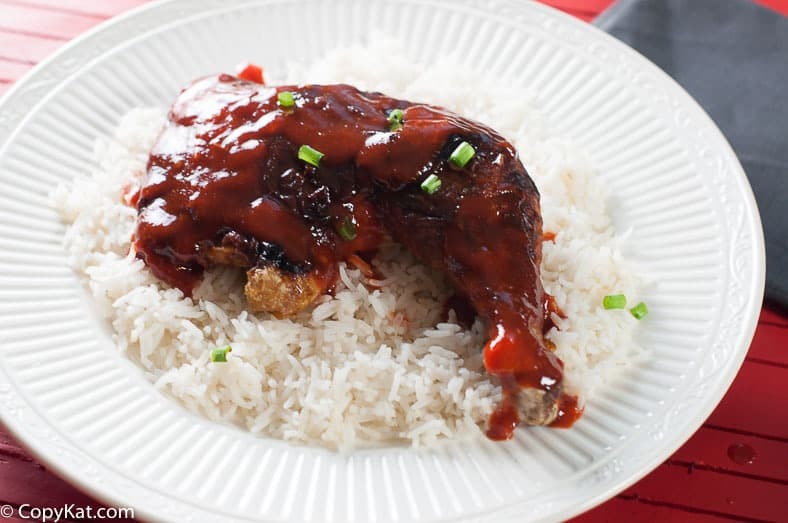 Sriracha Honey Glazed Leg Quarters is a delicious way to prepare chicken. Leg quarters are inexpensive and can be purchased for so little money. Are you ever looking for a new way to prepare chicken? I love using chicken leg quarters. They are inexpensive, flavorful, and they are easy to prepare. You can often purchase large bag of these at the grocery store. Leg quarters often go on sale. I love to prepare leg quarters as a way to help me stretch my grocery budget. Chicken leg quarters are so versatile. You can cook them in so many ways. I have used them in preparing homemade chicken and dumplings, in chicken salad, and in so many other countless ways. Have you tried Sriracha sauce? Some people call this Rooster sauce. No matter what you call this sauce, it is a wonderfully spicy sauce that you will fall in love. I think if you just pour this over chicken it is going to be too spicy so combining it with honey, and a touch of lime juice, and garlic you will have an incredible sauce. 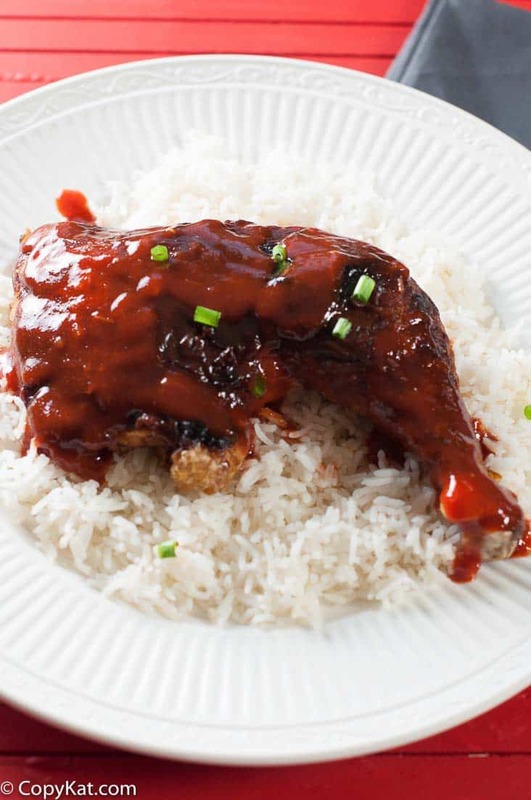 Sriracha honey glazed chicken is an easy meal to prepare, you will make this fantastic spicy sauce, and then you will divide the sauce, some to coat the chicken with, and some to dip your chicken in if you want a little more spice. You will fall in love with this easy to prepare chicken. It is perfect for the weeknight. I know you will love these Sriracha Honey Glazed Leg Quarters. Looking for more chicken recipes? Be sure to check out some of my readers favorite chicken recipes. Sriracha can turn chicken leg quarters into something amazing. While the oven is heating salt chicken and place it skin-side down in a hot skillet. Cook chicken over medium-high heat and allow the chicken skin to brown. Some of the fat in the chicken should render while the chicken in browning. So there is no need to place oil in the pan. Flip chicken over and allow it to brown on the other side. In a small bowl combine Sriracha sauce, honey, lime juice, and garlic. Whisk the sauce together. Reserve two tablespoons of the sauce for serving with the finished chicken. Place sauce into a large bowl. Place the leg quarters one at a time, and coat with the Sriracha sauce. Place chicken on a wire rack on a baking sheet. Repeat with remaining pieces of chicken. Bake chicken for about 45 minutes or until when the chicken is pierced with a sharp knife the juices run clear. Serve chicken with remaining sauce. They have 10-pound bags of chicken leg quarters at Walmart, Meijer, and more. I discovered them 10-16 years ago at Walmart when they were $6.99 but lately, they’ve been $3.99. Normally, there are nine HUGE pieces, but lately, there are about twelve smaller pieces. I rinse the chicken and freeze the pieces individually in zipper bags, then rinse them again when I get them out to use them. I’ve just been ovening the chicken, skin side up, in a dry skillet at 450F. It takes about 90 minutes from frozen solid to finish, with a crisp skin and meat that surrenders easily, leaving gristle and bone behind. The fat is all rendered, so the meat is juicy, and there’s no sticking to the skillet. Sometimes I’ve dusted the chicken with paprika or dill or stew herbs, but usually, I just add salt and pepper. I like sriracha, so this recipe sounds wonderful. Thank you, Steph! I like the dry skillet method you talk about. I want to give this a try soon.